I wanted to build myself a dolly to transport my Sunfish down the beach, or maybe just to get the boat from a parking lot to the water if the boat launch ramp is too crowded. I have spent some time looking around online at a few different options, including options to purchase as well as a variety of home-made dollies. Seitech dollies seem to be one of the more popular brands to purchase, and start at about $425. another similar option is the Trailex universal dolly, starting at about $450, but that is with the 6″ wheels – another $100 to upgrade to 8″ wheels! a third option, similar in style to the 2 above, is the voodoo dolly by Windline Sails (he has a GREAT “how-to” section for Sunfish) – the Sunfish version of the dolly is $370. 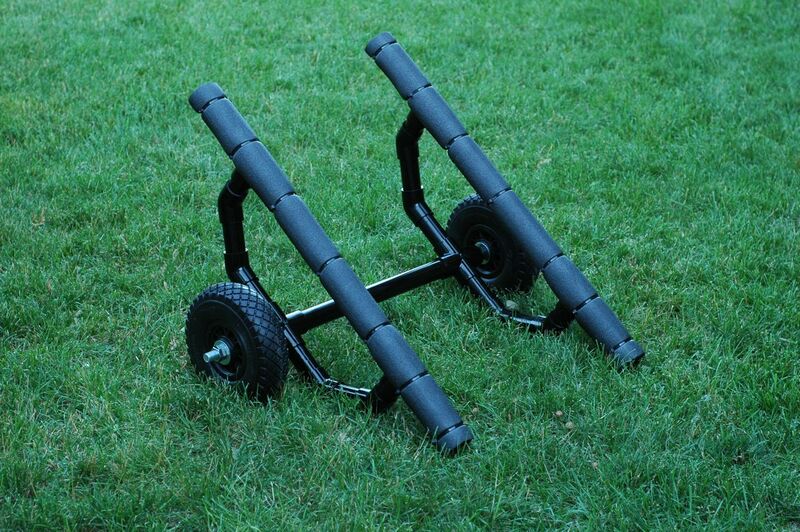 a much smaller option is the Rollaboat Tote dolly, priced at $135. I didn’t like this option, as I was concerned that there was too much of an possibility to over-stress the daggerboard trunk area. this is a home-made version, built using mostly threaded pipe sections, and details of its construction are here. this is a nice video series for a homemade sunfish dolly – here is part 4 of 5 (there’s 5 total videos, this one gives you a good idea of what the dolly looks like and how it would work). it’s made with mostly lumber products, so avoids threaded pipe or dealing with PVC. there are several other options for Sunfish dollies over in the “Files” section at the Sunfish Sailor Yahoo Group – if you’re not a member of that group yet, go sign up, and browse through the files to see more options for the dolly, as well as a wealth of other information. probably my favorite option from that group is the Sunfish Beach Dolly by Jim Manta. it is made out of PVC pipe, is plain and simple, and seems to be favored as a good do-it-yourself option. 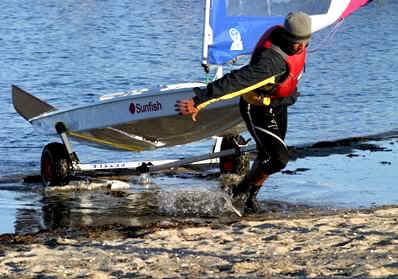 there are detailed instructions and a parts-list at the Sunfish Sailor Yahoo Group. I decided to build my own version of a PVC dolly, similar in style to Jim’s, but a slightly different setup, and a few tweaks (not necessarily for the better!). I used 1 1/4″ PVC pipe, a slew of PVC fittings, a 3/4″ threaded rod for the axle, and these foam beach wheels. these wheels were a cheaper option than the fat beach wheels Jim Manta used above – we’ll see how well my PVC dolly performs on sand, though. I probably got the names wrong on the last 2 PVC fittings – the 1 1/4″ fitting slips into the 1 1/4″ cross, and the other end is female threaded for a 3/4″ fitting. then the 3/4″ male threaded portion is screwed on. the 3/4″ axle fits pretty snugly inside of that fitting. I will probably revisit the hardware store to see if I can find a PVC piece to fit inside the 1 1/4″ pipe, and then the 3/4″ rod inside of that – similar to the style Jim Manta used for his dolly – but I think his axle diameter was smaller, so am not sure if I can get that to work out or not, based on available pipe sizes, anyway. anyway, the PVC dolly is now built, seems to hold my Sunfish pretty well, and a beach test will hopefully confirm that it works in sand. the dolly should work fine, though, to roll my Sunfish down the boat ramp at my local lake. I did update the construction just a tad, though. as I was trailering the boat a few weekends ago, the vibration from bouncing along down the road caused the (2) nuts on one end of the axle to spin loose, and fall off as I was driving down the road! in fact, if I hadn’t stopped in time, I probably would have lost one of the brand new foam wheels as well. Great post, I’ve been looking for ideas to build a kayak trailers and a dolly for my Force 5. Thanks for more ideas! I’ve seen the one where you fit it into the daggerboard area. I think that would be a hassle just trying to get the boat off that. Love your home made one! Kudos. You’ll get it perfected! And then you can patent it and make your millions! LOL!! I’ve often thought about putting instructions on here for the boat cradle. But that’s for another time. Enjoy and kudos to you! I agree with the above poster. Your design looks great, and I think you could easily sell it. More professional looking than the others…Well done. kir, thanks for stopping by – my spray paint job is what’s fooling ya! I just hope the dolly works well enough for me… no desire to try selling it. We noticed the comment that someone is afraid of overstress on the daggerboard trunk if they were to use the Rollaboat Tote. We have been using the Rollaboat Tote for years on our Sunfish and have had no stress on the trunk at all. I did a similar thing with my axle. However, drill the hole for the cotter pin right through the flat of the nut. This way the nut will keep the correct adjustment and not be floating on the edge of the pin. Sort of like how a castle nut would work on a real axle. PMB, that’s a great idea – I hadn’t thought about it. I probably won’t re-drill mine, but if I ever have to do it again, I’ll use that idea. Bought my first Sunfish last week end and found your site shortly thereafter. I have really enjoyed it. Made the dolly today and found it difficult to keep it in place under the boat as I moved it around. I also found it challenging to get the boat on it from the trailer. I am hoping to be able to single handedly take the boat the lake and launch it in an area where a trailer launch is not possible. I was wondering if you have made any adjustments to the dolly to improve it. Thanks for the blog…it’s fun to follow. Jay, yeah the dolly can be a bit finicky. did you use the foam/insulation? that helps “stick” a bit to the underside of the boat. I usually try to position the dolly about 2/3 of the way back, and steer using the bow handle. to get it back on the trailer, I roll the boat to the back end of the trailer, and then I use the rubber guide/wheel on the trailer, and sort of ride the Sunfish up that wheel until it is far enough on to rest on the bunks. often I end up standing up on the trailer to do it. maybe try it a couple more times? I haven’t modified the dolly at all – but I might end up modifying my trailer to make it easier to work with the dolly, and to give me some storage space. since I never launch off the trailer anymore, I don’t need to be able to back it down into the water or anything. Appreciate the comments… I haven’t played with it again yet….darn work getting in the way of play. I don’t have rollers on the trailer but I watched the video you have above and thought that lifting the stern off the trailer and onto the dolly might be a good way to go. I may try to hook up tie-downs to it too to hold it place for the little hills around here. Hopefully there will be a breeze this week end! Good Design…I added 4 more t’s at the 45 degree angle and spanned the axle width front and back with 1 1/4″ PVC to increase the structural integrity. fred, glad to hear you liked it, and improved it, too! what kind of wheels are you using, and have you tested it out yet? The weak link in most homemade dollies seems to be the wheels. I’ve sourced some seitech-type wheels and need to know if there is enough interest to justify a large order. The wheels very good quality with 1 inch dry roller bearing hubs. Drop me a line at http://www.boatwheelz.com to let me know if you have any interest. Matt, I’m happy enough with my current dolly wheels. they are not great for sand, but they’ll get the job done. good luck with selling the tires. I am assuming that making your own dolly was cheaper than buying one and am looking at using your design. I am wondering though, how much about did all the supplies cost together? Kelly, strange to think I never mentioned that?! and now I can’t honestly recall, but I’m sure it was less than most of the commercial ones I listed above, and I would think less than $100, even with the foam wheels. Hi. Which diameter bushing option did you use please? Also, why is plastic better than metal for the bearings? Gunner, I believe that I bought plastic bushing, the 3/4″ size to match the 3/4″ threaded rod I bought. you could probably use the other bushings sizes if you buy that matching bushing. I think the plastic might be more appropriate for a beach dolly just because it will be getting wet a lot, and would hold up better with the moisture. Hello, First of all thanks. This post was of great inspiration to me. I made mine quite on the same design (and not for a sunfish). Regarding the question about price, I spent 67 EUR for all materials (wheels being the more expensive part, 26EUR). Okay, I have a dumb question. I’ve got all my parts (minus foam and lock nuts, out of stock), but I’m wondering: was this a dry fit or did you use an adhesive? I dry fit it first, and then used the PVC adhesive. Sorry, other question: You’ve listed the size of the top bars, but I’m trying to figure out the pipe lengths between connectors on the two Us. I can try to do the math of it, but I’m not entirely sure what you mean by 21″ center to center – is that the pipe with the axle in it, or the U arms? Emily, no worries. I’ve been meaning to sketch up something better with dimensions on it. the 21″ is the spacing between the (2) u-shaped frames (perpendicular to the u-frame, or along the length of the axle). I feel like I’m pestering, but what is the length of pipe segments in the U? 3 inches, 2 inches, varies? I think I can count 12 segments by the pic for the Us, and with 27 inches remaining (after arms and center rod), I think that comes to 2.25 inches per segment. Does that sound right? It looks like the segments aren’t equal in length, but it could also be the angles messing with my eyes. Emily – I’d have to measure it to be sure. they do vary in length. if I was starting from scratch, I’d probably add a tee fitting in the middle of the axle, to give the option to add a handle section that goes forward to the bow. your dolly is interesting. bookmarked for later reading….. 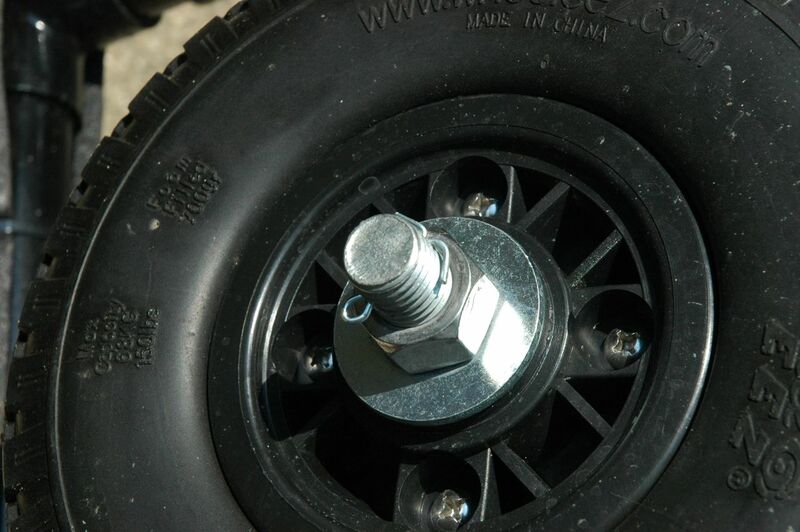 I have a junked two wheel wheelbarrow axle ….hope to figure out your carrier . At the moment my new rudder (christmas present) demands a spring post mounting. Trouble—- the bored hole seems too small. Worried that forcing the spring post could crack the new rudder. Anyone know what the original hole diameter for a spring post? Dave, I don’t know the hole size. Can you enlarge it slightly to fit the spring post better? Where did you find your foam wheels? We have been using the Rollaboat Tote Dolly for 4 years and have experienced no stress on the daggerboard trunk. Al, that is great to hear. Thanks for commenting! What would you say the weight limit would be on that? Just got some great 13″ wheels at Harbor Freight, rims and wheels about $14 each. Great on sand.